The TakeUntil subscribes and begins mirroring the source Observable. It also monitors a second Observable that you provide. 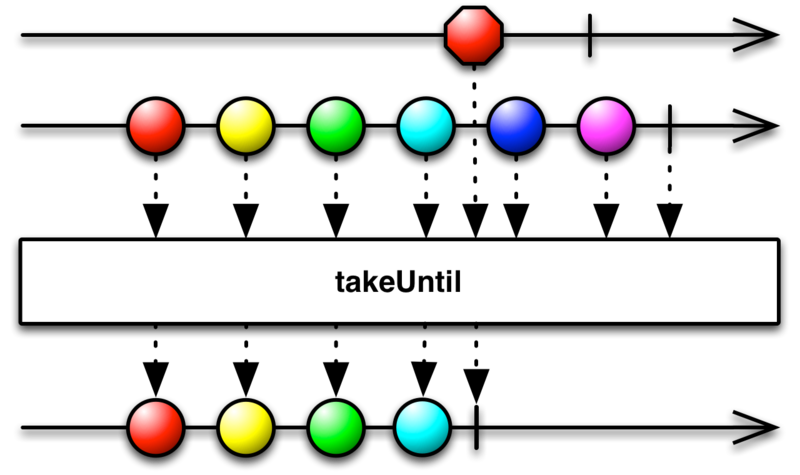 If this second Observable emits an item or sends a termination notification, the Observable returned by TakeUntil stops mirroring the source Observable and terminates. In RxGroovy, this operator is implemented as takeUntil. Note that the second Observable can cause takeUntil to quit emitting items either by emitting an item or by issuing an onError or onCompleted notification. takeUntil does not by default operate on any particular Scheduler. A second version of this operator was released in RxGroovy 1.1. It uses a predicate function that evaluates the items emitted by the source Observable, rather than a second Observable, to terminate the resulting Observable sequence. In this way, it behaves in a similar way to TakeWhile. In RxJava, this operator is implemented as takeUntil. Note that the second Observable can cause takeUntil to quit emitting items either by emitting an item or by issuing an onError or onCompleted notification. A second version of this operator was released in RxJava 1.1. It uses a predicate function that evaluates the items emitted by the source Observable, rather than a second Observable, to terminate the resulting Observable sequence. In this way, it behaves in a similar way to TakeWhile. RxJS implements the takeUntil operator. You can pass it either an Observable or a Promise that it will monitor for an item that triggers takeUntil to stop mirroring the source Observable. There is also a takeUntilWithTime operator to which you can pass an absolute time or an initial duration, but this is described on the Take operator page. RxPHP implements this operator as takeUntil. Returns the values from the source observable sequence until the other observable sequence produces a value.